Knee replacement exercises are a vital part of the recovery process to ensure you get the best results from your new knee. Surgery is just one part of the treatment for knee arthritis - what you do before and afterwards will have a big impact on your recovery. After a knee replacement, you can get up and about very quickly. As well as practising walking, it is also important to be doing knee replacement exercises to build up the strength of the new knee and get it moving properly. 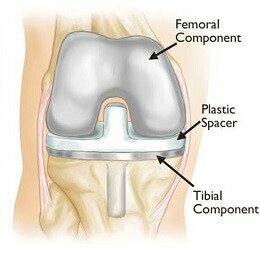 Here you will find a whole range of knee replacement exercises that are really good to do in the early stages following surgery. They are also suitable to do beforehand in preparation for operation. All these exercises are suitable for both Total Knee Joint Replacements and Partial Knee Replacements (aka uni-knees). 3) Function: as the strength and flexibility of your knee improve, you will find it gets gradually easier to do daily activities e.g. walking and stairs. Knee exercises can be started straight away after a knee replacement and will need to be continued for at least three months. It can also really help to do the knee replacement exercises before you have your surgery, to make sure the muscles are in the best state possible. Starting early can make all the difference to the recovery process. I have ordered the knee replacement exercises starting with those to do in bed, then in a chair and then the exercises to do standing up so you can progress through as you recover. Choose the ones you find work best for you – keep doing them until they become too easy. I would also recommend checking out the Exercise Top Tips and Getting The Best Results pages to ensure you achieve the best results from your knee replacement exercises. These knee replacement exercises can be started almost immediately after surgery. They will help to loosen up the new knee and reduce the swelling. Starting Position: Lying flat on your back or sitting up. Leg and knee straight out on a bed or along the floor. Progression: Carry out the exercise as above but when you’ve bent your knee as much as you can hook a towel over the ankle and pull it towards you to help the knee bend further – you can achieve the same effect by hooking your opposite foot over the ankle and pushing with that leg to gain more knee bending. You should be able to start these knee replacement exercises as soon as you are able to get out of bed. Progression: Strengthen further by adding a weight either by wearing a shoe or ankle weights. 2) Once you have slid your heel back as far as you can, raise yourself up on your chair using your arms and slide you bottom forwards keeping your foot still. You will find this makes your knee bend even more. Purpose: Maintain and strengthen the Glutes (buttocks) without the knee moving. If the glutes are weak, more force goes through the knee. Starting position: Lying down or sitting up. Once you are feeling confident on your feet, you can start these standing knee replacement exercises. Hold onto something stable like a table for some balance. Starting position: Stand with your feet slightly apart, weight equally distributed, holding onto something solid for balance e.g. kitchen work surface or wall. Once you can happily do all of these knee replacement exercises, you are ready to progress onto more advanced exercises. Remember, you will need to continue with your knee replacement exercises for a good few months to get the most benefit. You will gradually be able to reduce how often you do them, but don't stop until you have regained full strength and movement. If you want to know more about knee replacements, including information on knee replacement recovery and frequently asked questions, click the links.